BetClic Casino will then reward you with a bonus (Welcome Bonus is for new players only). The terms and conditions of the bonuses vary between different casinos and might also change over time and between different countries, so it is important to compare the different offers and read the T&C for BetClic Casino before signing up. 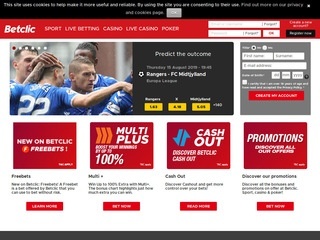 Betclic Casino is a gateway to the exciting world of sports betting and casino gaming with millions of satisfied customers vouching for quality of service and fair treatment. The Casino was born in 2005 and has since faithfully followed in the footsteps of its older and successful sibling called Expekt. Striving to provide the same high quality casino games, the team has partnered up with industry giants such as NetEnt, Microgaming and Nyx. New members will be welcomed with a bonus worth up to €200 and then continue to benefit from deposit bonuses, cashbacks and free spins pretty much every day of the week. The Casino is operated by Mangas Gaming Malta Limited, a subsidiary of the Betclic Everest Group. Licenses issued by the Malta Gaming Authority and the UK Gambling Commission should put your mind at ease when it comes to safety, while eCOGRA’s Safe and Fair seal testifies all games deliver fair outcomes. Betclic Casino is a NetEnt-powered casino happy to host a number of other reputable developers, among which Nyx, Microgaming, Yggdrasil, Play ‘n GO, Lighting Box, Quickspin, Big Time Gaming, iSoftBet, Pragmatic Play, Push Gaming and PariPlay. All games are instantly accessible online regardless of whether one uses a desktop or a mobile device. Free-play option provides an opportunity to learn about the game’s mechanics before one risks real cash. Betclic mobile site is just as user-friendly, if not more. It offers access to over 400 slots, table games and live dealer games no matter where you happen to be. If you’re unsure of where to start, use provided filters to display most popular, hot or new games, single out those developed by a certain provider, or choose your favourite theme. NetEnt titles seem to win the popularity contest and you probably won’t be surprised to see Starburst, Gonzo’s Quest, Guns ‘n Roses and Dead Or Alive listed among those players like the most. Yggdrasil provides hits such as Vikings Go Berzerk, Double Dragons and Jokerizer, along with Holmes And The Stolen Stones with 5 different jackpots to be won during Jackpot Free Spins. Play ‘n GO brings back their popular character in Hugo Goal and Elk Studios reunite us with mischievous Bloopers in more recently released Platooners slot. Da Vinci’s Treasure from Pragmatic Play will send you hunting for treasures, looking for prizes behind works of art, and playing for free with increasing multipliers. Book Of Gods by Big Time Gaming plays with cloning symbols and lets you buy a feature. Arabian Nights, Hall Of Gods and Mega Fortune currently have the potential to make you a multimillionaire, and if you’re lucky enough to score with Mega Moolah, chances are you’ll never have to work again. 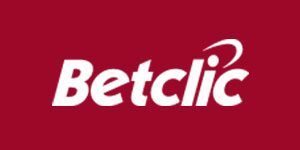 Betclic takes equally good care of those who prefer table games to slots. Roulette plays as European, French and American. There are multiple Blackjack variants to pick from, some of which offer additional win opportunities via side bets. Fans of card games can alternatively wager on Baccarat, Punto Banco, Red Dog, Txs Hold ‘Em, Caribbean Stud or Casino Hold ‘Em. You’ll also find a single game of dice called Vegas Craps. The list of about dozen Video Poker games includes standard and Double Up versions of the most popular game variants, such as Jacks Or Better, Deuces Wild and All American. Betclic Live Casino is a nice surprise, firstly because there are 50 table to pick from, and secondly because they’re delivered by Evolution Gaming. Whichever Live Roulette, Blackjack, Poker or Baccarat table you choose, expect to be greeted by a friendly host happy to chat. If your preferred online payment tool happen to be credit / debit cards, you’ll be happy to know Betclic allows deposits to be made via Visa and Visa Electron, MasterCard and Maestro. They also support the two most popular eWallets – Skrill and Neteller, as well as PaySafeCard and Bank Transfer. Payments can be made in EUR, GBP, PLN, HUF, CZK, SEK NOK, BRL, CHF or USD. There are no fees except for 2% charged for credit/debit card payments smaller than €100. Minimum transaction limits have been set at €10 for deposits and €15 for withdrawals, and the most you’ll be able to collect in one go is €10,000. Withdrawal processing can take up to 48 hours though members report getting paid within as little as 24 hours. Betclic is super-serious when it comes to safety of financial transactions and prompt and fair payments, demonstrated by a complete absence of any negative reports. Help Centre covers FAQs related to your casino account, deposits and withdrawals, Help icons are available on every page, and Betclic customer support team will be happy to answer all your questions and help resolve potential issues. You can chat with them live 10:00-23:00 CET any day of the week or send them an email. The operator is committed to answering all email queries within 24 hours or less.